Former Secretary of State for Education Kenneth Baker claims that secondary education has become a five-year programme with a single, narrow aim: to prepare pupils for high-stakes GCSE exams at 16. From 2015, all young people will be legally required to stay in education or training until they are 18. Kenneth Baker sees this as a historic opportunity to re-think the aims and structure of English education. He argues that the National Curriculum should extend only to the age of 14 and that there should be four distinct pathways from 14-18 to take account of young people's emerging interests talents and ambitions: Liberal Arts; Technical; Sports and Creative Arts; and Career. 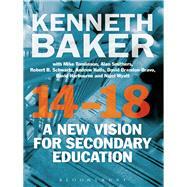 All pathways will provide a broad education, but each will have a distinctive character matched to the talents and ambitions of individual students.In 14-18 - A New Vision for 14-18 Education, Kenneth Baker builds a compelling case for reform, with contributions from a range of educationalists who draw on their direct experience, the history of English education and practice elsewhere in the world.An essential read for anyone interested in the future of secondary education. Kenneth Baker is Chairman of the Edge Foundation, which champions technical, practical and vocational education, and of the Baker Dearing Educational Trust, which is establishing a new network of University Technical Colleges in all regions of England. He was elected to Parliament in 1968 and was a Junior Minister in Edward Heath's government. He held a series of Ministerial positions between 1981 and 1992, including three years as Secretary of State for Education and Science (1986-9). He was Home Secretary from 1990 to 1992. In 1992, he became Lord Baker of Dorking and is an active member of the House of Lords.Mike Tomlinson is a leading educationalist and chaired the Working Group on 14-19 Reform which reported to the Department for Education and Skills in 2004.Alan Smithers is Director of the Centre for Education and Employment Research at the University of Buckingham, UK.Robert B. Schwartz is Francis Keppel Professor of Practice of Educational Policy and Administration in the Graduate School of Education at Harvard University, USA.Andrew Halls is Headmaster of King's College School, Wimbledon, UK.David Brandon-Bravo is Headteacher at Parkfields Middle School, Toddington, UK.David Harbourne is Director of Policy and Research at the Edge Foundation, UK, an independent education charity dedicated to raising the status of technical, practical and vocational learning.Nigel Wyatt is Executive Officer of the National Middle School Forum, UK.